As our senses accustom to the dark and rumbling atmosphere, Tero Saarinen and Kimmo Pohjonen appear barefoot in hazard suits on two raised paths leading away from each other in a ‘V’ shape, an arid, post-apocalyptic landscape in which air seems to be the one element in short supply. The two men have not yet met; they are wholly involved in their individual survival. There are flashes of light, sometimes directly in our eyes as if we too are on this blasted heath, with the sound of electrical short-circuits amplified to a level of a burnt-out desolation. This is the Beckettian setting of Saarinen and Pohjonen’s new work, Breath, which received its world première at the Grand Théâtre in Quebec City on April 12 before moving to Montreal’s Cinquième Salle at Place des Arts as part of the Danse Danse program. 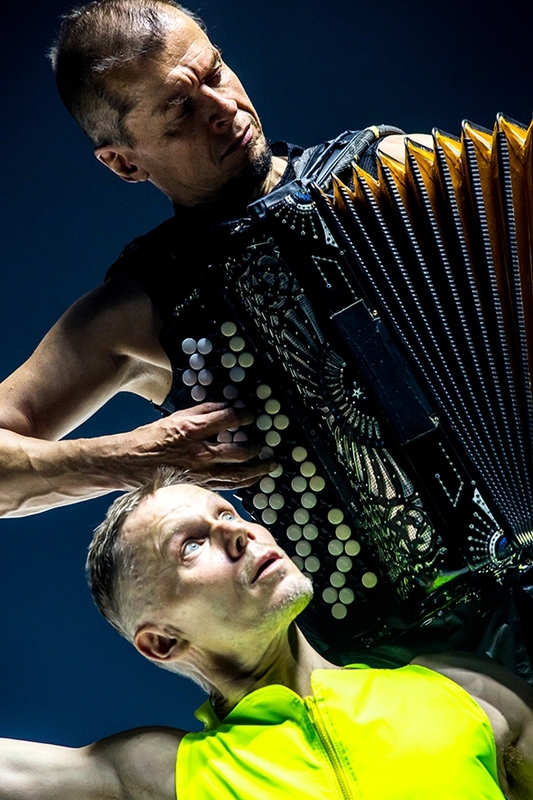 Saarinen is a dancer and choreographer who has directed his eponymous company in Helsinki since 1996, while Pohjonen is an acclaimed Finnish composer and accordionist. Along with their individual artistry, each has brought long-term collaborators into the creative mix: Saarinen’s lighting and set designer, Mikki Kunttu, his costume designer Teemu Muurimäki, and Pohjonen’s sound designer, Tuomas Norvio. Breath starts as a desolate journey nowhere, an existential supplication to an unknowable fate, but the richness of expression of the five collaborators turns the journey into one of sublime meaning as if by some alchemical process they transform their coordinated theatrical experience into a profoundly human revelation. Pohjonen appears as a mythical figure, bruised and torn, wandering aimlessly with his electrified accordion strapped to his body like an armoured, serrated shell that he plays without seeming to move his hands. His sounds range from the breathless rasping of parched lungs to the full blast of a pipe organ and it is his intricate improvisation that gradually transfigures Saarinen’s persona from that of traumatised survivor to pilgrim in search of atonement. Over the course of Breath their symbiotic relationship, in which the visualization and aural expression of breath act as guides, brings their paths closer and closer together until their communication is complete. Saarinen, without seeing him at first, hears Pohjonen’s notes with their percussive beat and responds to them like an automaton that has lost its programming: short staccato twists and turns of his body while his eyes stare ahead, sucking in what air he can inside the helmet of Muurimäki’s hazard suit. Pohjonen carries his instrument like a breathing machine, investing the landscape with the air on which both travellers depend. As they become aware of each other they use their voices in a guttural, unintelligible flow of grunted communication that paradoxically keeps them apart. It is the music that proves transformative; as it fills with richness and volume, both men discard their helmets and Saarinen’s movement becomes more fluid to the point of flight, as suggested by the metaphor of billowing material he sweeps around and over him. It is Pohjonen who manifests the power — sound is the metaphor for life — to which Saarinen is drawn inexorably but it is Saarinen who initiates the first steps to come into contact with him. The musical notes may be instigated by Pohjonen and his accordion but it is Norvio who processes and amplifies them to fill the theatre as if they had the composition of air; heavy waltzes and redemptive chords merge with miked footfalls and electro beats to create a soundscape that becomes a cathartic journey from parched desert to cathedral nave. In the same way, Kunttu’s visual environment initially engulfs us in its impenetrable density; this is the last place on earth to expect the faint glow of exit signs. If darkness is suffocating, Kunttu’s use of stroboscopic white light is a shock treatment to allow in some air, a visual defibrillation that breaks down Pohjonen’s and Saarinen’s movement into incipient spasms of activity. His subsequent washes of intense colour — blue and yellow — affirm the life-giving properties of light, of sky and sun, that seem to impregnate the white material of the costumes and to refresh the figures on their journey. Saarinen quotes Samuel Beckett in the program: ‘Dance first. Think later. It’s the natural order.’ On a narrative level, Breath can be understood as an allegory of a journey from despair to salvation, but on a purely theatrical level its creation of sensual unity through the inspired integration of sound, movement and light is what takes hold of the imagination and endures. The appearance of Tero Saarinen Company as part of the Southbank Centre’s Nordic Matters brought a refined Finnish sensibility to the Festival Hall stage that reminded me of the architecture of Alvar Aalto: it establishes its individuality and subtle independence from its surroundings through the use of natural materials and sophisticated design. The stage setting by Mikki Kunttu for Saarinen’s Morphed (2014) — the one work on the evening’s program — immediately immerses us in this quintessentially Finnish quality by referencing the colours and materials of Aalto’s furniture design which in turn were influenced by the Finnish landscape. The two lines of evenly spaced ropes that hang on three sides of the stage form an enclosure around the rectangle of white on a black floor. Based in Helsinki, Saarinen founded his company in 1996 ‘to promote a humane worldview and basic human values through the language of dance’. Perhaps because dance is performed in and on the body, it is an art that naturally eschews violence and in Morphed Saarinen traces states of mind and body from baseness and introspection to elevation and refinement in a group of seven men from his company. Despite its overtly male focus, Saarinen takes the clichés of maleness and turns them inside out. By the end we can associate with this ‘journey less traveled’ and find solace in its resolution. We first see the men in black fatigues and hoods prowling in fluid patterns of geometric complexity. For a work celebrating all aspects of maleness, this is as good a place to start as any, but with the sophisticated music of Esa-Pekka Salonen, Kunttu’s neat and beautifully lit abstraction of a forest and Teemu Muurimäki’s stylish costumes, it has to be said these men have already come in from the rugged outside. Initially Saarinen traces paths of weighted, pack-like formations but as the work develops individual performers begin to slide away from the pack to explore their own individuality in expressive gestures before they become subsumed once again within the group. Over the course of the work the gestures develop into solos, duets and trios that expand their reach and choreographic force as each man develops in his own right. Part of the intrigue of Morphed is that Saarinen’s performers at first look less like dancers than wholesome, blonde, bearded Finnish men who exude masculinity without being macho. They could be athletes; if I recognized some sporting motifs in the choreography one of them derived from shot-putting. Placing these powerful bodies in this kind of environment is to transform them. Saarinen works with the physicality of bodies to explore the means of change; the blunt, earthbound postures of the dancers at the beginning gradually respond to the musical ideas to develop the poetry of their instruments while maintaining their connection, gaining in self-expression and articulation while allowing space for each other. Arms and torsos elongate and feet point beautifully, reminding us of Da Vinci’s maxim that beauty is in the extremities. One could almost imagine Salonen conducting the dancers to draw out their intrinsic qualities. 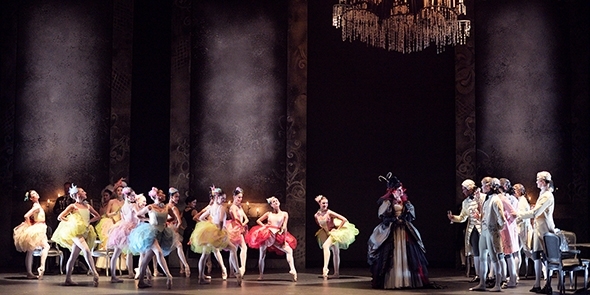 The costumes and lighting are implicit partners in this process. Over the course of the performance the dancers remove the initial dark, heavy outer garments to reveal white shirts whose sleeves detach, like layers of skin, until it is the skin that remains. At the same time the lighting morphs in response, from somber dawn to bright sunshine. In this sympathetic depiction of maleness, all the men — all but one — change from hooded prowlers to half-naked open channels of emotion. Saarinen takes us on a journey that could be our own. Indeed, he suggests it is our own and holds up his choreography as a mirror to guide us, avoiding exaggerated movement in order to include us within its measured articulation and rhythms. And although the cast is predominantly Finnish, there are two exceptions. David Scarantino is a dark-haired American whose presence avoids a sense of cultural homogeneity (Morphed is about men, after all, not just Finnish men), but it is Ima Iduozee, whose dark brown skin and lithe movement add an exotic, feline quality to his Finnish identity, who suggests he may be the catalyst of physical transformation within the context of Saarinen’s language. It is as if he has been there before and is returning to help his comrades morph into their spiritual dimension.